BEIJING, Jan. 13 (Xinhua) -- Standing on the peak of Mount Qomolangma, Luo Jing looked down on the world from the highest point on earth. She saw the rolling mountains, covered by pure snow; everything was at her feet. She took a deep breath and closed her eyes, just as she did ten years ago, when she was at the rock bottom of her life, gazing at the world downward from the top floor of her apartment, ready to extricate herself from all the suffering. "The international mountaineering team [behind us] have descended and confirmed [that I have ascended the wrong peak]," Luo announced on her Weibo, denying the feat she was thought to have accomplished in her own name. At last, she chose honesty over honor. "For me, honesty to myself is more important. If I cannot accept the accomplishment of [ascending all the eight-thousanders] completely at ease, I would rather let go of it. It means time has not come yet," she said. According to Luo, the peak they successfully ascended was the Central-Peak of Shishapangma, the second top at 8008 meters, whereas the Main-Peak stands about some 300 meters away at 8027 meters. She had careful discussions with other experts, comparing photos and videos from her attempt and those of confirmed ascents, before she came to this conclusion. Although a local authority insisted where they had reached was the highest point of the mountain, she believed that photos and videos don't lie. "I know this will let many down, but still I decide to post it. Facts are facts," she wrote. "These 14 eight-thousanders are identified on an international standard. If you are after the title, you have to follow the international rules and practices," she said. "She was brave enough to admit it," said Chen Xin, a friend of Luo who has been sponsoring her adventure in the name of her company since 2017. "It takes greater courage than climbing a mountain." "But compared with her personal achievement, I think what she did is a more significant milestone for Chinese mountaineering," she added. Making the announcement means she has to start all over again, stepping back to the danger and uncertainties in the howling wind. But this does not frighten her. She would frustrate her sponsors, who were not informed of the announcement ahead. This didn't bother her. What tore her apart was the fact that this would disappoint her 13-year-old son, who has been looking up to her, and who was the reason she is still alive. In 2005, Luo gave birth to her son Nuo Nuo, whose name and that of his father were frequently mentioned in her conversations with friends about her busy but sweet everyday life. But only one year later, the happy mother and wife found herself heavily indebted with over two million yuan (about 294,000 US dollars) borrowed by her husband, who disappeared all of a sudden. After learning that her husband was in prison, she not only sought legal assistance, but also reached to the acquaintances who might be able to get him out. However, her begging was only met by euphemistic refusals and even curses behind shut doors. "She kept it all to herself until she could no longer hide the truth from me," Luo's mother recalled. "I know it was destructive to her, but she never revealed her emotions." During those days, she had to move a dozen times to avoid the debtors that knocked at her doors with threats to her life, both in reality and in her nightmares. She had to piece together her broken heart and told her one-year-old son "Don't worry, daddy is just out for a business trip." There were times when she stood on the top floor of her apartment building, gazing at the busy city downward. "A simple jump could end all the suffering," she took a deep breath and closed her eyes. But Nuo Nuo made her give it a second thought. 'What would happen to him if I commit suicide?' The idea reminded her that despite being a destitute wife, she was also a needed mother. She decided to repay the debts. She sold her house and lived with mortgage payments of 6,000 yuan a month. She commuted nearly three hours every day for a job that paid her 2,000 yuan a month. She ran a small business all by herself to make more money and saved every penny possible at the same time. In 2007, the 32-year-old shook off all the debts and the burnt phoenix was ready to emerge from the ashes. After years of enslavement by the heavy debts, she could finally be able to live for herself. "To the mountains," there was a voice inside her mind, reminding her what she had been dreamed of before life hit her hard: "To the mountains," it said. And to the mountains she went. "I didn't even know why she made this decision. She was so thin, so little, less than 40kg. From a young age she ate very little and her feet were always cold in winter," her mother recalled. "She told me it's about realizing her dream." A former white collar worker in an IT company, Luo is also a fond lover of outdoor sports. Camping and hiking were part of her life and mountaineering was what she had long been dreaming of. "She is born for mountaineering. She has light breaths and steps." This is how a friend she met in an ice-climbing activity described his first impression of her. Being a quick learner and a determined climber, Luo broke her own record for the highest mountain ascended from 5000m-plus to 7000m-plus in merely a year and a half. "Climbing makes you look upwards. I was first attracted by the sport because it makes me feel not that hopeless," Luo said. However, climbing the eight-thousanders is often seen as a luxury for the rich, with a single attempt costing at least 200 thousand yuan. To realize her dream, Luo could only rely on the strict budgeting with the money she saved from selling her house and offset with mortgages. When she first got started, what kept her warm was only a pair of second-hand mountaineering pants worth 200 yuan. Expenses were great headache for her, especially after she quit her job in 2010, and sometimes what filled her mind when she descended was how to repay the debts she owed to the climbing companies. That explains why Luo, unlike other mountaineers, put the most difficult mountains, K2 (8485m) and Annapurna (8090m), higher on her agenda - she was not sure when financial difficulties might cost her this dream. On Dhaulagiri, Luo encountered a Green Boots for the first time. Its skin had become translucent after resting in eternal peace for maybe decades accompanied by snow and wind. At that moment, Luo was overwhelmed by the unprecedented awe for the mountains, for nature and her predecessors. 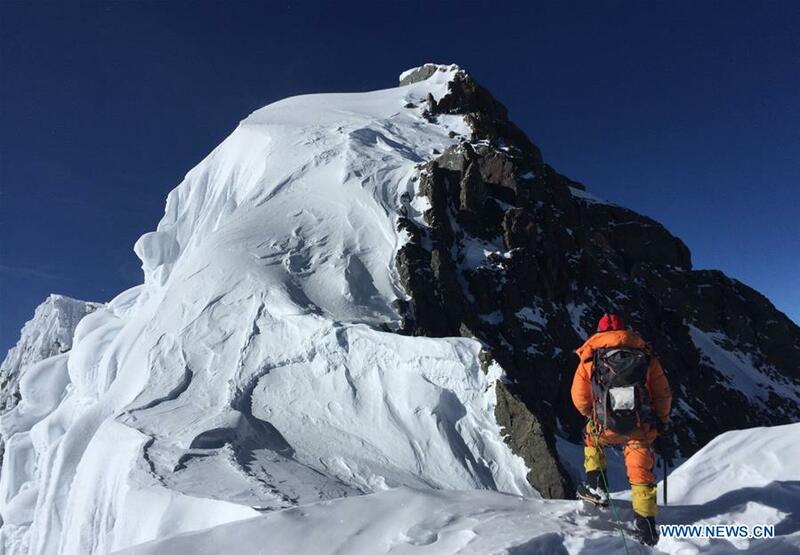 Death came closer when Rao Jianfeng, her mentor in mountaineering that guided her to ascend her second eight-thousander Makalu (8463m), was killed in a shooting at the camp of Nanga Parbat in Pakistan. Rao was to climb Gasherbrum I and II with her a month later. However, on a crowded subway, she received the heart-breaking news which left her all alone in her endeavors. She hesitated when she considered if she could continue her journey. A great majority of her friends suggested that she cancel the trip, but it was an e-mail from a Spanish mountaineer that helped her make up her mind. It read: "Don't let your fears control you." She clicked on the "confirm" button. She was not alone when she stood on the peaks of the Gasherbrum; a photo of Rao kept her accompany. Tears streaming down her face, she recalled what her mentor once said to her: "It is better for a mountaineer to rest in the mountains doing what they love than to die facing the unknown." Her first close contact with death was in 2013, on Kanchenjunga, where Luo lost a third of her 15-man team when they descended. Three mountaineers and two Sherpas, elite mountaineers and guides in their local area, now rest in the pure white snow, with the picture they took on the peak capturing their last smile. And she was just a few seconds away from writing a last chapter of her life on Broad Peak in 2015 when an avalanche caught her team off-guard. The tiny Chinese woman and her build-up teammates were all powerless against the rage of mother nature. When Luo regained consciousness, she found herself buried under heavy snow, unable to move. Her body was almost twisted into a V-shape backward, and the snow on her chest was about to smother her. "I'm done," she thought in desperation. "I will never see my Nuo Nuo again." "That was not a whim but a carefully-made decision," Luo explained about her "madness." "It was a great mental challenge which forced me to grow. I know I was not experienced enough, but I was able to get over my fear in a short time. I was level-headed." Although she did not make it that time, her resilience and perseverance was enough to impress a male foreign mountaineer that climbed with her. "You look weak but you have a tougher heart than I do." After she descended, Zhang Yue, her alumni who volunteered to be her contact person, was shocked by how badly she was injured from the photos she took. "She spoke so little about the avalanche that I didn't realize how horrible it was." It was then when Zhang got to understand why this gentle-looking lady was able to top those eight-thousanders. "Deep in her heart, she is more stubborn than anyone. She just won't give up until she has given it all." What didn't kill her made her stronger. She is no longer a follower. She formed a small chat group with her best friends where she could receive updated weather forecasts and gather the wits and expertise in complementary for her increasing experience. "We have no clue what she actually wants," a guide in her team confessed. Unlike many people that fancy an experience, she wants "challenges and growth." "People have different understandings of amateur mountaineering. If you simply want to try it for one time, there's no problem in relying on assistance from others, but if you truly love the sport, there will always be a voice inside your mind telling you to go for more," she explained. "The essence of mountaineering is not about one or two successful ascents, but overcoming the many difficulties you encounter along the way and learning from them. In this way, you will be stronger and more rational." She received much more than challenges and growth along the way. As she put it, mountaineering has changed her values and the way she perceives the world. "I think mountaineering is like a kind of monk's discipline. It cultivates your heart and your mind. I was after money, fame, social status and so on, but these external things no longer take up a large share of my life," Luo said. "All these don't matter when you are trying to ascend a mountain, so if you can bring this mentality back into daily life, you will find that your life is much happier than before." However, there are always two sides to every coin. As Nuo Nuo's birthday is during the climbing season, she was unable to celebrate by his side for the fifth consecutive year. "The birthday gift I want most is to have her celebrating my birthday with me," Nuo Nuo said in tears. Leaving Nuo Nuo behind has always been a most difficult part of Luo's journey. But she believes mother and son are destined to part ways one day. The important thing is to make him and herself independent. Therefore, the harder Nuo Nuo cries when she is about to leave, the bigger she tries to smile. "How could I be so cold-hearted to leave him behind calmly? Of course I want to spend as much time with him as possible," she said. "But I don't think a mother must sacrifice the right to pursue her dreams just for the sake of her son." Even so, being a single mother that takes part in such a risky and extreme sport that at least takes her a month away every year from her son, not to mention her life, she was often labelled as "irresponsible" by some critics. She has a donkey toy hung on her bag every time she set out for the mountains. It was a gift from her son, which reminds her of the responsibilities she has. "My responsibility is to fully assess the situation and avoid taking unnecessary risks, but not give up trying," she said. "Moreover, this actually gives my son more freedom to grow and to be independent. Love from a mother shouldn't mean protecting her child in every aspect like a hen protects her eggs, but to enable her kid to become stronger." When climbing is not a pressing agenda item, Luo enjoys spending time with Nuo Nuo. She moved her family to Chiengmai, Thailand, and sent Nuo Nuo to an international school while taking him to guitar, football and other classes on weekends. She even encouraged her teenage son to climb up a mountain at 5025m, a tough experience which he felt proud of. "I just want to expose him to more possibilities of the world, to experience different ways of life," she said. Luo holds the belief that her pursuit of dreams will encourage Nuo Nuo to do the same. Therefore, she never stops in her steps, but goes foward. "I never thought of ascending all the 14 eight-thousanders when I first got started, not until the recent years after I ascended the K2. At first, I just wanted to give it a try and later I just followed my heart," the 43-year-old said in retrospect. "I have made 13, why not the last one? At least I have no reason to give it up." Despite the two failed attempts this year, Luo is still not ready to give up yet. "Next year, we will try again. May the force be with us," Luo wrote on her Weibo. In addition to her last endeavor, she has also opened a company called 'highlight' that focuses on low-altitude hiking, so that the Sherpas that don't love mountaineering so much won't have to risk their lives to make a living. She has also made several recent paragliding attempts. She is now a certificated paraglider and climbed up a mountain and flew all the way down to welcome the new year. "We are getting older inevitably, but is there anything that can resist this trend? Yes, growth can!" Luo posted on her social media after a dozen attempts at the beginning of the new year. "Always reach towards the light and the sky spiritually. Keep growing," she added.